Hitman Sniper is memory intensive. Devices such as iPad 2, iPad Mini, iPhone and iPod Touch 5th Generation will suffer from occasional dips in performance. Take on the role of Agent 47 in Hitman Sniper a fixed position shooting game set in beautiful Montenegro. Scope in on your marks using skill, subtlety, subterfuge and the environment to complete your contracts. Eliminate targets, collect weapon parts and complete blueprints to unlock the most powerful rifles! Features Immersive sniping game based on the Hitman universe Complete over 150 missions. Eliminate the top criminal elite! Replay and uncover more secrets as contracts evolve Compete against your friends & dominate the leaderboards! Master undetected kills using your surrounding environment Unlock and assemble 13 epic sniper rifles Compete against your friends and the world to become the best silent assassin in Hitman Sniper, the definitive sniping experience for phones and tablets! Step into the shoes of a true professional assassin and kill time with Hitman Sniper. Death is at your fingertips. Check these links to find your download for Hitman: Sniper for & iOS or for your device iPod TouchiPadiPhone. 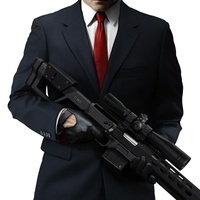 The app Hitman: Sniper is compatible with te following devices.